The rambling mind of a modern day hobbit. Discussions of drinks, hats, cigars, shaving, cars, tiki, retro, polypop lifestyle, music and more. Lets talk exotic liqueurs. Ti-toki liqueur from New Zealand is made from Titoki berries, kawakawa and manuka leaves. It is a sweet liqueur reminding me of Licor 43 or Nassau Royal. It has hints of vanilla, but after that the tastes become exotic. Hard to describe but it is mellow and almost flat at first. The tastes open up as you continue to sip it. After a few sips the flavors become more complex, but still undescribable, especially to those of us, not used to New Zealand herbs, and flavors. The flavor of manuka is clear in this liqueur. Manuka is a native shrub or small tree to New Zealand and southeast Australia. Manuka is a Maori word, but the Australians call it tea tree, probably from Captain Cook who used the leaves to make a tea drink in his early explorations of New Zealand. Manuka contain high antibacterial potency and the plants have been used by the Maoris as a natural medicine. The Ti-toki liqueur company produces the product in a hand crafted tekoteko crock. A tekoteko is a Maori term for a full figured human form. They are usually found attached to a gable of the whare (house), or freestanding close to the whare. They are usually carved with the tongue outstreched and contain paua shell inlayed eyes to ward off intruders. The crock is available in a 500ml capacity or can be purchased in a glass bottle for less money. The crock comes with a cork that must be opened with a wine screw, but they give you a cork cap after the original has been removed. The bottle cost about $60 USD. Thankfully this one was a gift. It tastes great straight, but if you add one part Ti-toki to 3 parts ginger beer it is a home run. 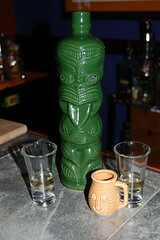 Exotic, fun and you get a cool Maori tekoteko to watch over your bar to keep away evil spirits (Barcardi). This sounds like a winner. Nassau Royale is one of my favorites from my Circus days. I will search for this concoction at my local mind-eraser/apothecary. Get a bottle of this a duty free both on your way into NZ and out. It is a very exciting drink that if you use your imagination while drinking will take you back to NZ with every sip. site's post to be updated on a regular basis. It carries good data. Excellent web site you have here.. It's hard to find high quality writing like yours these days. I honestly appreciate people like you! Take care!! Asking questions are really nice thing if you are not understanding anything entirely, however this paragraph gives fastidious understanding yet. Just who is this Loki?